So if you want to get technical, this COULD qualify for part of my 365 portraits challenge to myself. (It could, honest!). 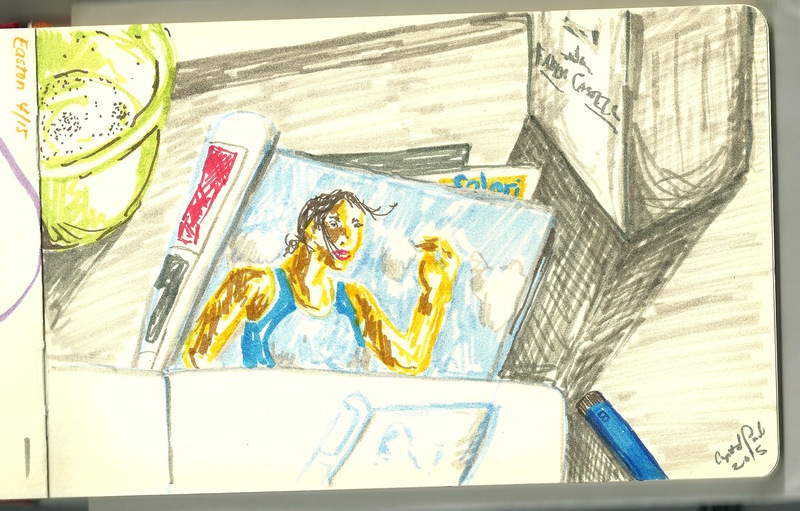 This is really a still life though of my sketchbook on top of a fitness magazine with the box of markers to the right and an empty bowl to the left, all on top of our outdoor patio table. It was breezy and cool the other day, but my boys just kept begging to go outside. The sun was shining and they were occupied for the most part, so who am I to say no. After finishing this, my one son decided to draw repeating “egg” shapes on the opposite page. I of course was covering up this sketch with my hands while he played. I’m sure if I turned my head even for a few seconds, this sketch too would be adorned with purple “egg” shapes.